Oaks frequently appear on fall hazard lists. “We’ve actually had great success planting oaks B&B in the fall—specifically swamp white oak (Quercus bicolor),” Erb says. “The fall-planted ones even put out typically twice as much growth for us the following spring than do the spring-planted ones.” Erb credits Nina Bassuk for this, as her research on methods and times of transplanting swamp white oak spurred him to plant them in the fall. Erb says Tree Pittsburgh has had no problems with B&B fall-planted red maples (Acer rubrum and associated cultivars and hybrids), London planetrees (Platanus x acerifolia), hornbeams (Carpinus spp.) and hophornbeam (Ostrya virginiana), all of which frequently appear on fall hazard lists. Some other “fall hazard” species that Tree Pittsburgh has had success with transplanting B&B in the fall—with caveats in parentheses—include tulip tree (Liriodendron tulipifera) (Erb found it needs to be transplanted earlier in the fall), black gum (Nyssa sylvatica) (similar survival rate to spring-planted trees), and Kentucky coffeetree (Gymnocladus dioicus) (when transplanted at 2- to 2.5-inch caliper). On the other side of the ledger, Tree Pittsburgh has tried fall planting of river birch (Betula nigra), flowering cherry (Prunus spp. ), goldenrain tree (Koelreuteria paniculata), and sweetgum (Liquidambar styraciflua)—but has had mostly failures with those species. Hence, these are some of the few species they avoid planting in the fall. Based on this installation schedule and his many years of observation, Cothrel avoids fall planting of oaks (except swamp white oak), magnolias (Magnolia spp.) (including tulip tree), river birch, black gum, beeches (Fagus spp. ), hawthorns (Crataegus spp. ), horsechestnut (Aesculus spp. ), and baldcypress (Taxodium distichum). 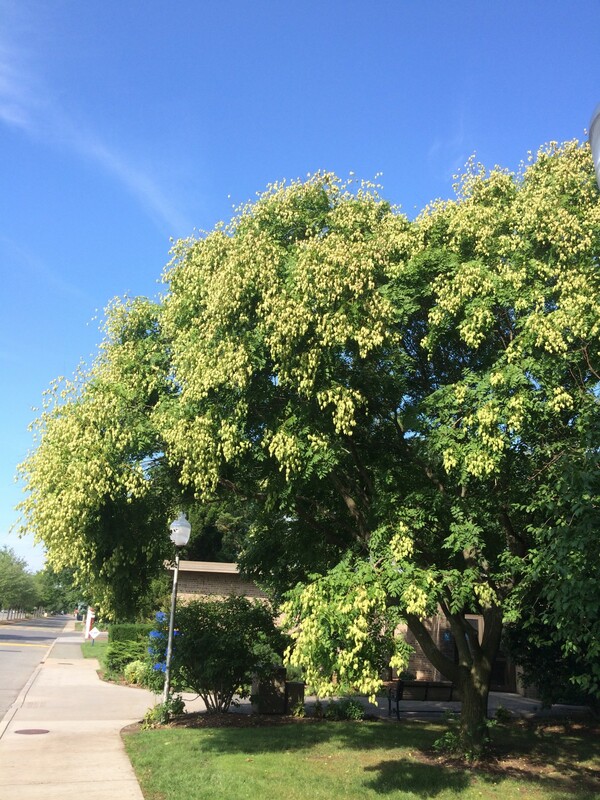 However, he says that he has observed no readily apparent survival differential between fall- and spring-planted 1.5-inch-caliper trees that some consider touchy in the fall, including lindens (Tilia spp. ), zelkova (Zelkova serrata), goldenraintree, callery pear (Pyrus calleryana), and elms (Ulmus spp). In her work in her home city of Ithaca, NY and with dozens of other municipalities, Nina Bassuk has found that for bare root trees under 2-inch caliper, it has been easy to successfully fall-transplant many of the trees frequently appearing on fall hazard lists—including London planetrees, goldenraintrees, crabapples (Malus spp. ), zelkovas, cherry trees, pear trees, oaks, and elms. This tells us that season + species isn’t the only key interaction in the fall hazard picture; production method comes into play as well. Bassuk says that the five major interacting factors influencing transplanting success are season, species, production method, size, and aftercare. Season is best understood in its interactions with the other factors, while the essential nature of good aftercare (watering, weeding, mulching, avoiding damage to bark, etc.) is obvious. Species: Bassuk and colleagues are currently investigating why some tree species are more difficult to transplant than others. It has to do with the ability of a given species to maintain hydraulic conductivity by avoiding cavitation (obstructing bubbles in the xylem) after its roots are severed. Why is bur oak (Q. macrocarpa) so difficult to transplant while its close relative, swamp white oak, is relatively easy? Production method: Bare-root digging takes exponentially more roots along than does B&B digging. For many species, if the bare root trees are handled properly (see www.hort.cornell.edu/uhi), bare root can translate to higher survival in spring or fall because of this larger root system. For notoriously difficult-to-transplant species, Bassuk says that container-grown trees are actually the safest best, because the entire root system is brought along/there’s no root severing to trigger cavitation. However, Bassuk acknowledges that container-grown trees of the species and size arborists desire are not always readily available. This is because the larger the tree caliper at transplanting, the greater the percentage of its roots are lost in the move; it takes a longer time for a root system to grow to support that larger canopy than it does to support a smaller canopy. “In my experience, size trumps season and species and production method,” Bassuk says. For this reason, she recommends that arborists, whether in spring or fall, consider planting B&B and bare root trees at 2-inch caliper or less; research shows they have higher establishment rates and catch up with or even outgrow their larger-caliper, more stressed counterparts. 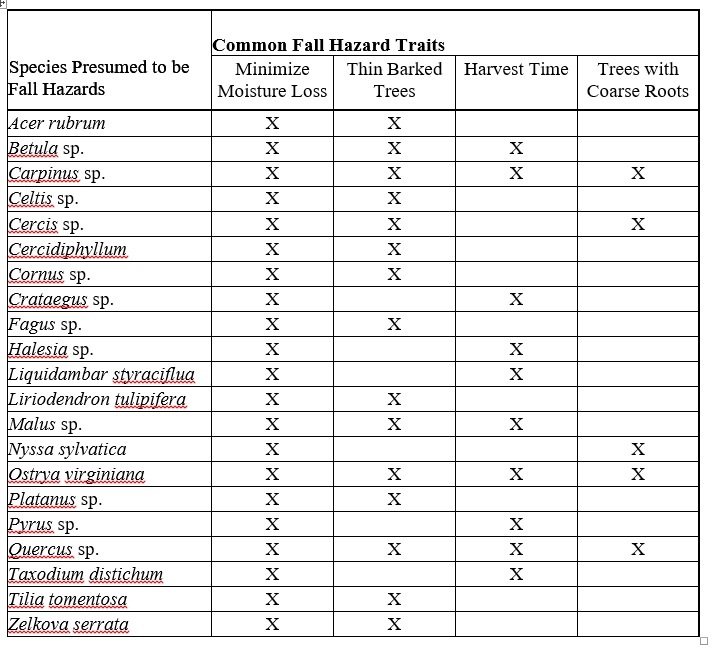 Based on his review of the literature and his experience in NYC, coauthor and Director of Street Tree Planting for NYC Parks Matt Stephens created a table (see below) that breaks down the four main traits for species presumed to be fall hazards and then gives advice to counteract these traits. His first piece of advice is to Harvest at the Right Time. During the fall, trees reach dormancy at different rates/on different schedules; depending on weather patterns, some trees go dormant very late in the fall. One reason that some tree species are thought to be fall dig hazards is that they have been harvested too early. An example of this can be seen with the genus Quercus, which goes dormant extremely late in the fall. A possible solution is to strategically procure trees from slightly more northern climates. For example, if Quercus were on a planting plan in the fall and timelines were tight, it would be wise to obtain trees from a reasonable northern source where there is an earlier digging season. This earlier digging could allow two to three weeks of additional time for planting ahead of locally grown trees. Regardless, Stephens believes it is absolutely critical—no exceptions—to ensure that trees are harvested in a dormant state. 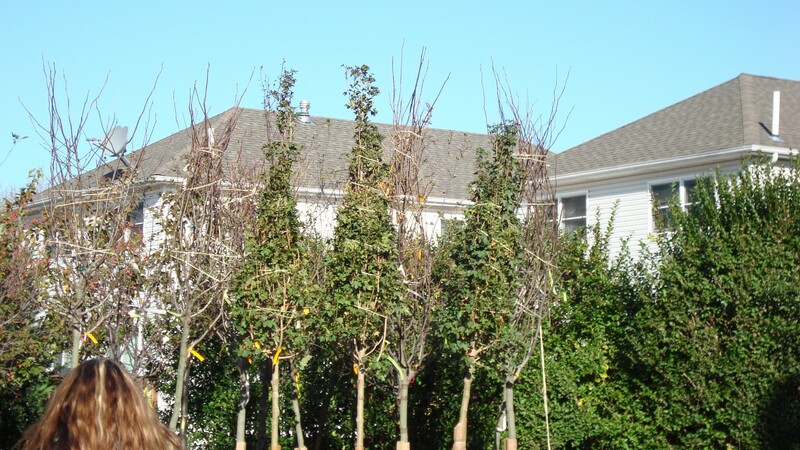 The reality is that an arborist’s work timeline can drive when trees get dug in the nursery industry, and nursery people understandably want to secure sales. Sometimes nurseries would rather sell the tree, attaching to it a “fall hazard” caveat, than lose the sale if they wait to dig the tree during optimal conditions when the trees are fully dormant. 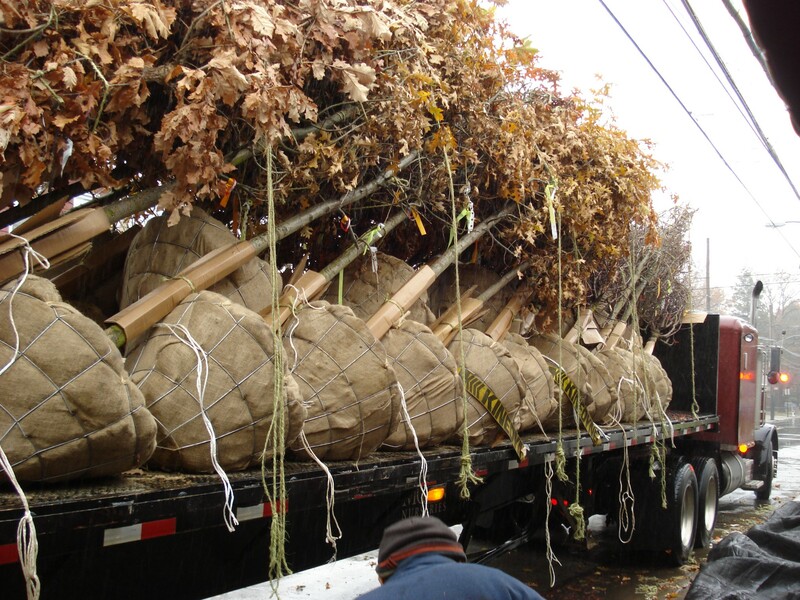 If they want to do more fall planting, arborists and cities should consider adjusting installation schedules to the needs of the species they are planting—e.g., planting oaks late in the fall. The second mitigation strategy is to Root-Prune Coarse-Rooted Trees. Some trees that have been labeled fall hazards have coarse root systems that regenerate more slowly. The genus Nyssa has a tap-root-like root architecture when compared to Metasequoia, which has a much more fibrous root system. Research indicates that the coarse roots of scarlet oak (Q. coccinea) require approximately three to four times longer to regenerate than the more fibrous roots of pin oak (Q. palustris). Also, if a tree with coarse roots is harvested in the fall and a harsh winter comes along, freezing the soil early and consistently, the tree becomes more easily desiccated due to an inability to absorb and replenish water. Therefore, any coarsely rooted tree should be prepared for digging in the fall by root pruning the previous spring. Careful root pruning in the beginning of the growing season forces a more fibrous root system by fall harvest time. For example, a 2.0- to 2.25-inch-caliper tree could be prepared in spring by spading two or three sides of the root system as if it were going to be placed in a 28-inch root ball. It would be left in ground and allowed to grow until fall harvest, at which time the tree would be spaded and placed in a 32-inch root ball. The third strategy is to Harvest Thin-Barked Trees with Abundant Twigs with Special Care. Deciduous trees desiccate during dormancy due to cold, wind, or sun, especially when the ground is frozen. This problem is compounded in trees that have thinner bark because there is more cambial activity on sunny days for thin-barked trees. Desiccation is also more likely on trees with abundant twigs because there is an increased surface area exposed to potential inclement conditions. Vulnerable tree types should be harvested in the right size root ball or one size larger in an effort to retain as large a root mass—and therefore more available moisture—as possible. Additionally, trees with thin bark and abundant twigs should be watered when possible during the winter season when there are extreme cold, windy, or sunny conditions. The fourth strategy is to Minimize Water Loss to Root Balls. After harvesting, trees need a constant source of water, especially when they are stored above ground. This is especially true in the spring; however it is still very relevant for the fall planting season. 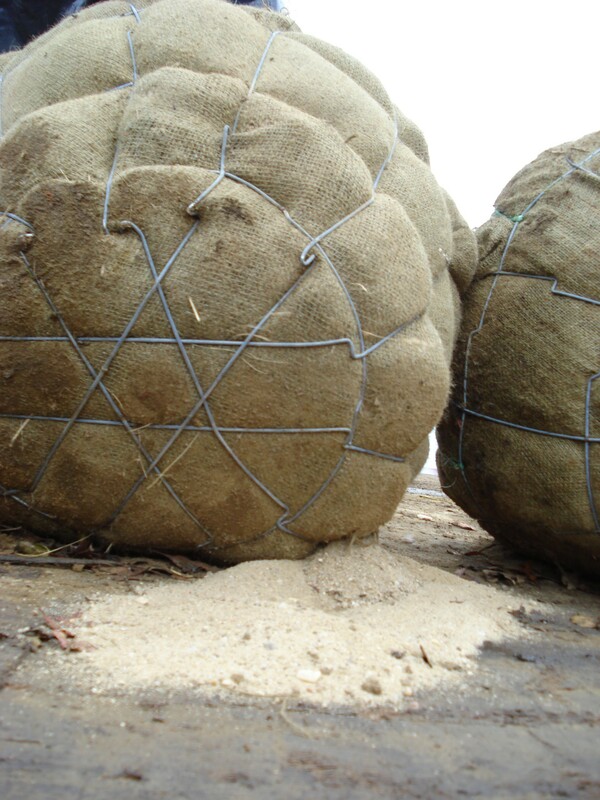 The outer layer of burlap around the root ball will wick water out of the encased soil during dry, windy, or sunny days. Trees should be well watered until they are planted in the ground; letting the root ball dry significantly even one time can cause tree mortality or make it virtually impossible to restore moisture to the core of the root mass. Depending on the weather conditions, it might be necessary to water an aboveground tree with a slow soaking for at least five minutes per day. Additional precaution could be taken by heeling the trees in mulch until they are planted.